Kashmir - Recently an Image from Indian Administered Kashmir has gone viral on the Internet in which a dead body of a young boy is being abused by the troops of Indian Army. According to the news from Indian Express, A young boy was killed by the Indian Army while the security forces were clearing the area from the suspected militants in the district of Jammu and Kashmir. 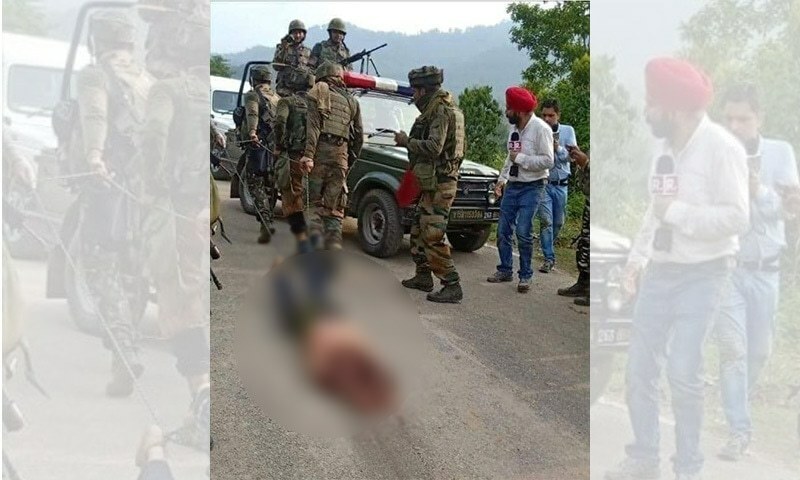 After the security forces killed that boy, the officer of Indian Army ordered his men to quickly knot his both legs with an iron chain and they drag his dead body from the area where this incident happened. The sad thing is that there are some media journalists of Indian News Channels can be seen in the image, but no one reported on this topic. Instead, the national media of India reported that boy a terrorist without giving any proof in their news reports. While talking to locals where this incident happened, An eyewitnessed said, "The Indian Army entered in our district of Jammu and Kashmir while they were heavily shooting at our houses, we were seeing all these from the rooftops and they were continuously firing and throwing hand grenades towards the houses of locals. They didn't find a single militant in the area and in response, they have Killed an innocent civilian." Recently, The United Nations had released a report on Indian Occupied Kashmir in which the UN clearly stated that India is severely committing human rights violations in Jammu and Kashmir meanwhile India ignore the UN reports and responded with illogical statements said that the report was released in favor of Pakistan.